MOSCOW, August 12. /TASS/. Two silver medals won by Russian swimmer Yulia Yefimova at the Rio Olympics are a big success for her and her country, considering that she was training for the competition at such a difficult period, Sports Minister Vitaly Mutko said on Friday. 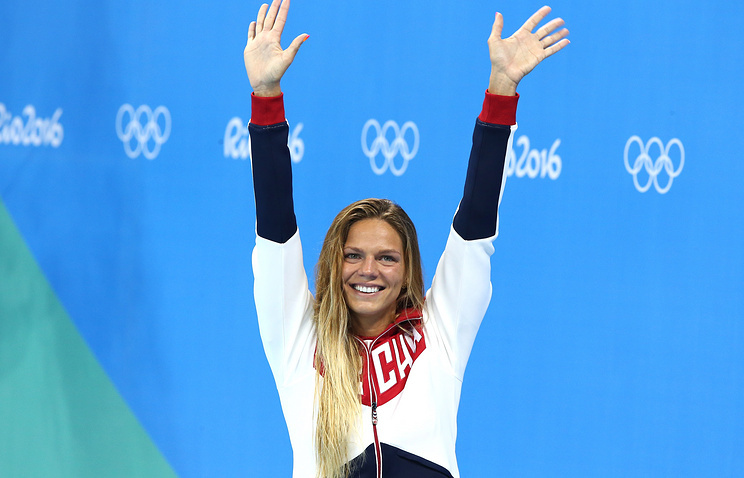 Yefimova won silver in women’s 100m and 200m breaststroke at the 2016 Summer Olympic Games in Rio de Janeiro. The Russian swimmer was admitted to compete at the Rio Olympics after her case was examined at the Court of Arbitration for Sport, which resolved that the requirement of the International Olympic Committee (IOC) for barring all athletes who had earlier been punished for doping abuse and had served their doping bans did not comply with the Olympic Charter. "Yulia Yefimova is an athlete of the highest level and we have had no doubts about her. She was training during a complex period and, therefore, the current situation for her and for all of us is a big success. She will bring us joy many more times," Mutko said. It is yet early to assess the performance of the Russian swimming team at the Rio Olympics, the sports minister said. "It is not time yet to assess the results in swimming as swimmers still have to compete in certain disciplines. In actual fact, you have to understand how fantastically US swimmers are performing as they are winning one gold medal after another. But it is good that young athletes begin to compete and join the elite," the Russian sports minister said. "We have to be competitive in such events as swimming, track and field athletics, shooting and rowing where more than 10 medal sets are up for grabs. We must always remember and understand this and aspire for this. We need to be competitive in at least 19-20 sport disciplines and in this situation I believe that Russian athletes are performing fairly well - both swimmers and the entire team. There isn’t a single day without a medal but it would be nice to make another step forward," Mutko said. After six days of competitions at the Rio Olympics, Russian athletes have 19 medals - four golds, eight silvers and seven bronzes.